The FTSE 100, CAC and DAX opened up the day by 0.3%, but with few potentially major economic catalysts until tomorrow, world stock markets are unlikely to make further significant moves in either direction. Daily oil prices are stabilising around the $70 marker which has given oil majors a boost and Chinese economic data has helped commodity stocks rise after being hit yesterday. Yesterday traders made a move on the pound ahead of the Bank of England inflation report. There were big falls against the yen, euro and dollar, and that trend has continued today, especially on the pound vs yen. 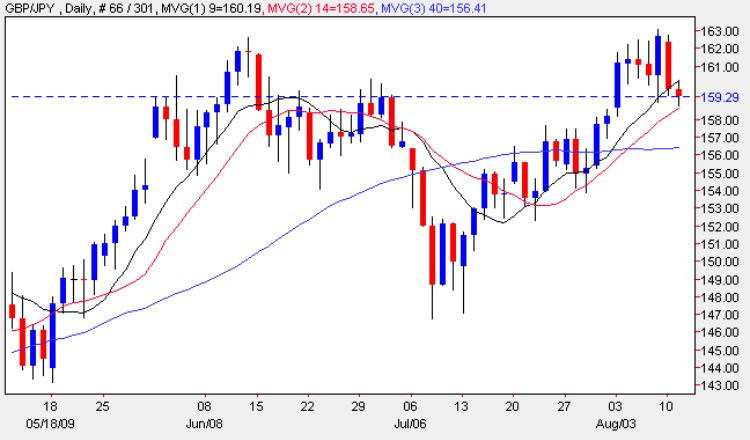 The GBP/JPY is trading just below the psychologically important 160.00 market, but so far the pair has bounced off the 159.00 level twice in the last three sessions. If this level holds again, it could present an interesting trading opportunity. My binary betting/fixed odds tip for today is a double (up) trade, especially if the pound vs yen dips back to the 159.00 level once again. In order to provide you with more help with your binary betting and trading I have recently added many new features to the site including live currency charts, the latest currency news and fundamental analysis on video every morning, live commodity prices, stock charts and index charts, along with a national holidays calendar, and finally if you are looking for a good ECN broker then please just follow the link.